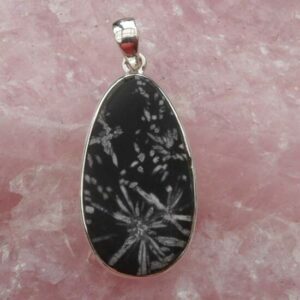 The composition of Chrysanthemum Stone is variable and the minerals are arranged in a flower like pattern. Chrysanthemum Stone helps us to see the beauty within, and to maintain that magic and wonder of childhood innocence. It is a stone of harmony and beauty. Material from the occurrence at Yonghe in Liuyang County of Hunan Province consists of Celestite, but specimens recovered from outcrops of the same strata at other places in the area are mostly mixtures of Calcite, Chalcedony and minor Dolomite and Andalusite which replace earlier Celestite. Japanese Chrysanthemum Stone is aragonite (or calcite pseudomorphs after aragonite) in schalstein matrix. There is a slight surface marking on the sphere, it does not effect the integrity of the stone.